Oxo-chemicals are generally derivative chemical compounds that are used in manufacturing of plasticizers, adhesives, paints and coatings, lubricant additives. Oxo group has divalent ligands that have the property of biodegradability on account of oxidative or cell mediated phenomenon that can take place simultaneously or successively. These chemicals are used in manufacturing or processing of oxo-alcohols that can be prepared by addition of hydrogen and carbon monoxide. These intermediate chemicals are formed by synthesis of gas with hydroformylation of olefins. These chemicals can also be converted to form acids besides alcohols. Oxo-chemicals can be used in manufacturing of wide range of products which include oil surface coatings, polymers, plasticizer alcohols and more which make them an attractive choice for a wide range of industry manufacturers. Oxo-chemicals are easily available at low prices that offer high quality and efficiency when used as plasticizers. Oxo-chemical derivatives for instance, plasticizers and ethers are the most widely used industrially. Additionally, n-butyraldehyde and C7-C13 plasticizer oxo alcohols are extensively used oxo-chemicals across the globe. Oxo-chemicals are an integral part of various end-user industries such as automotive, OEM and construction. Oxo-chemicals Market is anticipated to record a CAGR of 6.8% over the forecast period. Many multi-national companies are concentrating towards new product advances in oxo-chemicals. Moreover, the many advantageous properties of oxo-chemicals are exploited in the field of OEM and paints and coatings industry. New uses for oxo-chemical derivatives are discovered on regular basis which is expected to drive the oxo-chemicals market rapidly. Currently the global oxo-chemicals market is observing vibrant growth on account of increasing demand of oxo adhesives, paints and coatings in the market. Advances in construction and building industry in the past few years and growing industrial, residential as well as commercial constructive explorations are projected to drive oxo-chemicals market besides the wide range of functions of oxo-chemicals in an immense range of products such as polymers, alcohols, acids, plasticizers, lubricants and more during the forecast period. On the basis of regional platform, global Oxo-chemicals market is segmented into five major regions including North America, Europe, Asia Pacific, Latin America and Middle East & Africa region. As a precursor to manufacturing polymers in automotive and OEM industries, North America is panned to observe substantial oxo-chemicals market growth due to rising oxo-chemicals usage in advancing automotive market. North America is expected to be followed by Asia-Pacific in terms of consumption due to expanding oxo-chemicals requirements in building and construction industries. On the back of multiplying oxo-chemicals uses in growing end-use industries across Japan, India and China, along with growing automotive advancements, Asia Pacific is budding as a regional oxo-chemicals and its derivatives consumption market. The rising demand for Oxo-chemicals and its by-products for various processes in automotive, OEM, construction and building industries are expected to drive the market rapidly over the forecast period. The growing R&D activity associated to oxo-chemicals is further expected to increase the market growth leading to discovery of new applications of oxo-chemicals around the world. Application of Oxo-chemicals in the production & manufacturing of various products and rising global consumption of plasticizer alcohols is estimated to drive the oxo-chemicals market during the forecast period. Moreover, applications of oxo-chemicals as solvents or coatings on account of their anti-corrosion and biodegradability properties have increased its demand across various end-user industries. Oxo-chemicals are used in production of alcohols, acrylates, acetates, lubes, glycol ethers, solvents, resins and more. 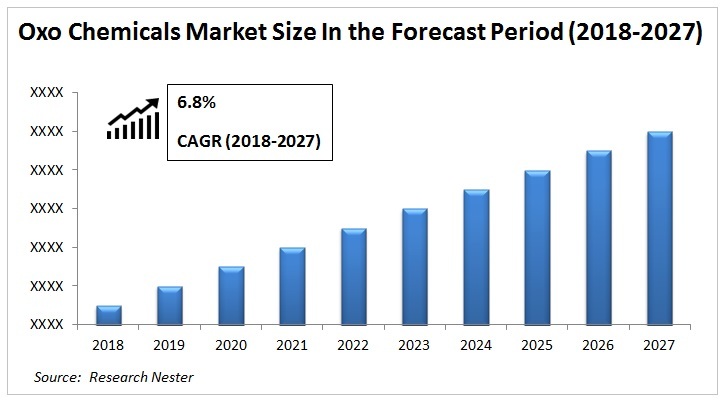 Rising paints and coatings along with textile industries are increasing demand for glycol ethers, resins, acrylates and solvents that are easily available at low costs, which will help the market grow during the forecast period. Rapid economic development with thriving manufacturing sector is expected to boost the Oxo-chemicals market in the Asia Pacific region. However, inappropriate waste disposal methods have led to increasing concerns regarding how they impact the environment. Such factors are expected to serve as a key restraint in the growth of the oxo-chemicals market.